At The Breakers Palm Beach, Virginia Philip and Juan Gomez oversee a vast wine list. 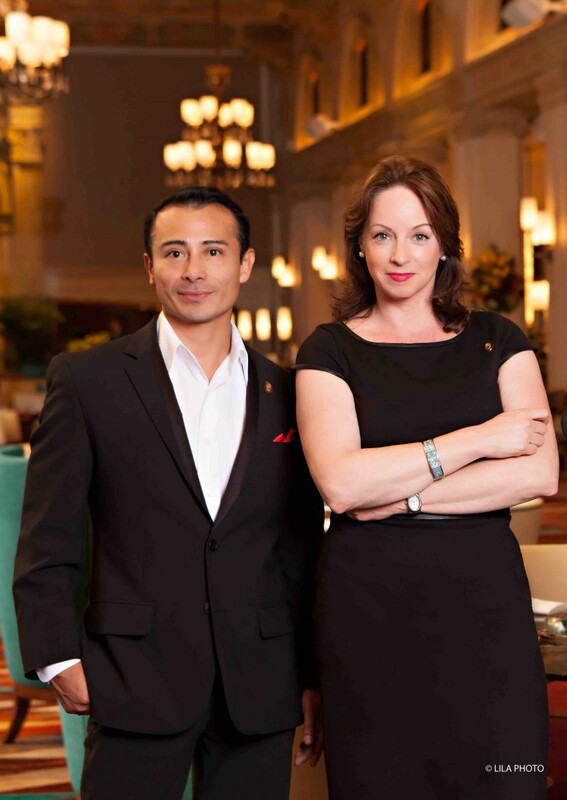 Master Sommeliers Juan Gomez and Virginia Philip select the wines for eight venues at The Breakers resort in Florida. Philip, who became the 11th woman to earn the title of Master Sommelier in 2002, serves as wine director at The Breakers and manages the resort’s 28,000-bottle wine collection ($45 a 750-ml. bottle of J. Lohr Estates Riverstone Chardonnay to $19,500 for the 2005 Domaine de la Romanée-Conti), along with a staff of five sommeliers. The first Mexican native to gain Master Sommelier status in 2007, Gomez is second in command and takes a key role on specific projects, such as the wine menu at the newest venue HMF (the initials of The Breakers founder Henry Morrison Flagler), which opened two years ago. The restaurant lists 1,600 selections and won a 2014 “Grand Award” from Market Watch sister publication Wine Spectator. Flagler Steakhouse, meanwhile, received a “Best of Award of Excellence” from Wine Spectator this year, due in part to the expertise of lead sommelier Greg Rivera. The Breakers also features the sake-focused Asian eatery Echo, family-friendly venue The Italian Restaurant, poolside breakfast and lunch spot The Beach Club Restaurant, casual daytime dining locale The Ocean Grill and outdoor bar The Surf Break. At HMF, notable by-the-glass selections include Monte Tondo Brut from Italy’s Soave region ($17 a 6-ounce pour), the 2012 Thierry et Pascale Matrot Maranges Vieilles Vignes from Burgundy ($18 a 7-ounce pour) and the 2012 Turley Old Vines Zinfandel from California ($22). The Seafood Bar offers standouts like the 2012 Robert Weil Tradition Riesling from Germany ($14) and the 2010 Elderton Shiraz from Australia ($15). At Flagler Steakhouse, highlights include the 2012 A.A. Badenhorst Secateurs Chenin Blanc from South Africa ($11) and the Clos de la Briderie Pureté de Silex Crémant de Loire ($16) from France. Meanwhile, Echo features the 2012 Jermann Pinot Grigio from Friuli ($14) and the 2013 Domaine Trotereau Quincy from the Loire Valley ($14). Top-selling bottles overall include Giacosa Fratelli Roero Arneis ($48 a 750-ml. bottle) and Castello Banfi Brunello di Montalcino ($152) from Italy; Billecart-Salmon Brut Réserve Champagne ($120) and M. Chapoutier Châteauneuf-du-Pape La Bernardine ($135) from France; and Cakebread Napa Valley Chardonnay ($118) and Patz & Hall Pinot Noir ($112) from California. “The sweet spot across the board is between $60 to $80 a bottle,” Philip says. The Breakers sees a steady stream of visitors, with the high season starting in mid-October and tapering off after Memorial Day, though Philip says the summer months have picked up. “Locals are a big portion of our business,” she adds. With Philip and Gomez in charge of the wine, they’re in good hands.